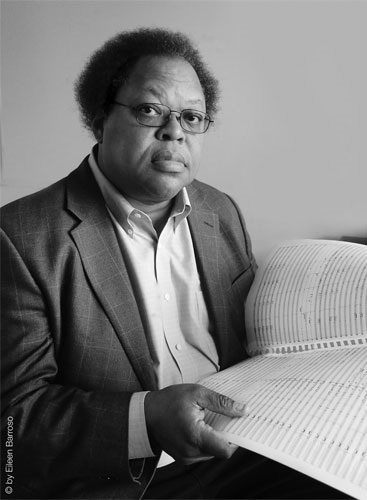 Edition Peters is thrilled to announce the beginning of a publishing relationship with George Lewis and the publication of five of his works: Anthem, Hexis, Memex, Mnemosis and The Will to Adorn. More publications will follow later in 2019. Prof. Lewis began his career with the AACM (Association for the Advancement of Creative Musicians) in 1971 and graduated from Yale University in 1974. He was the Music Director at The Kitchen in NYC in the 1980’s and has performed and recorded extensively with luminaries of jazz and experimental music, and since 2004, he has served as Edward H. Case Professor of American Music at Columbia University. As a composer, he is increasingly present on the concert music stage, and the trend continues in 2019 with new works being premiered by the Los Angeles Philharmonic, Ensemble Intercontemporain and loadbang. The music of George Lewis has been performed by the BBC Scottish Symphony Orchestra, London Philharmonia Orchestra, Radio-Sinfonieorchester, Stuttgart, Mivos Quartet, Boston Modern Orchestra Project, London Sinfonietta, Spektral Quartet, Talea Ensemble, Dinosaur Annex, Ensemble Pamplemousse, Wet Ink Ensemble, Ensemble Erik Satie, Eco Ensemble, and others, with commissions from American Composers Orchestra, International Contemporary Ensemble, Harvestworks, Ensemble Either/Or, Orkestra Futura, Turning Point Ensemble, San Francisco Contemporary Music Players, 2010 Vancouver Cultural Olympiad, IRCAM, Glasgow Improvisers Orchestra, the Los Angeles Philharmonic and others. A Fellow of the American Academy of Arts and Sciences and a Corresponding Fellow of the British Academy, Prof. Lewis’s other honors include a MacArthur Genius Award (2002), a Guggenheim Fellowship (2015), a United States Artists Walker Fellowship (2011), an Alpert Award in the Arts (1999), and fellowships from the National Endowment for the Arts. Most recently, Prof. Lewis received an honorary doctorate from Harvard University and was inducted as a member of the American Academy of Arts and Letters (2018).